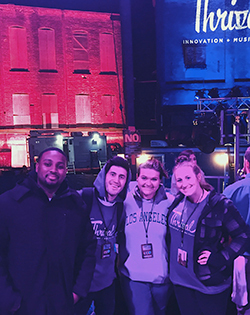 Sports, arts and entertainment management students at Point Park University continue to connect with real-world opportunities working in live entertainment management. 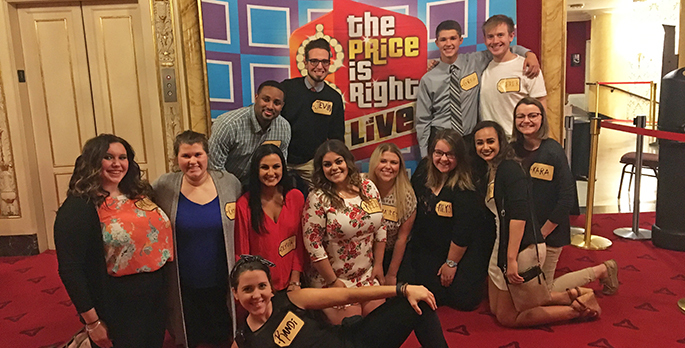 SAEM students worked at the Thrival Festival, a two-day outdoor live music experience in Pittsburgh's East End, and at a live taping of the The Price is Right show at Heinz Hall. "It's great to see our students take advantage of our Downtown Pittsburgh location and the many opportunities to work at such diverse shows and events," said SAEM Associate Professor Ed Traversari, M.B.A.
"At the Thrival Festival, I had the opportunity to check in VIP guests and work Facebook and Twitter for Thrival. I learned more about coordinating social media and how to make sure all questions coming in on the days of the festival got answered," explained Baylee Zimmerman, a senior SAEM major and president of the SAEM Club. 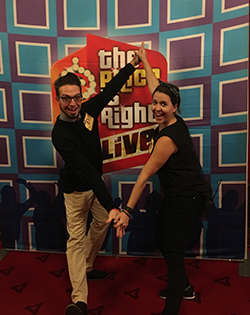 Transfer SAEM student Jevin Fluegel was thrilled to work at the Price is Right touring show. "The Price is Right staff made sure we felt like we were part of the staff, but also expected us to work hard in return. The highlight of the experience was interacting with all of the excited fans of the show," Fluegel said. "This event showed me that I am so happy I chose Point Park to earn my bachelor's degree. It's a place for students to grow and allows them to choose what life path they want to take. I can't wait for more opportunities like this and look forward to seeing where I go next," he added. "Working at the Price is Right was very interesting because it taught us how a show like this is set up as well as how to manage volunteers and register contestants, which is something we learned about in our Event Management class," said Cassandra Crisp, an SAEM junior. For SAEM junior Alyssa King, a key takeaway from working at the Price is Right show was the importance of keeping fans happy. King said: "Many of the fans had been waiting for hours to check in and were very excited so we had to match their excitement. It is very easy to be overwhelmed by a lot of people, but making sure guests have a wonderful experience should always be our first priority." Check out the concerts and events SAEM students worked at this past summer.